A beautiful fried turkey from last year! WIth the exception of Thanksgiving Day and Christmas Day, All orders have a $500 minimum or 25 people (packages). Please refer to the Holiday Menu tab, or to the Menu/Book now tab for our full catering menus. 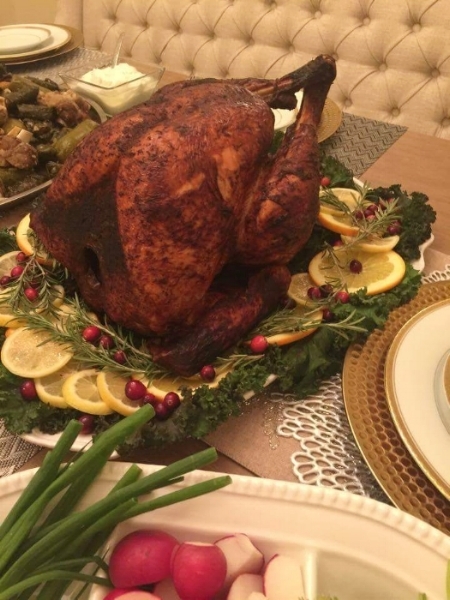 Single Turkey or Ham orders will only be placed on Thanksgiving Day and Christmas Day. Happy Holidays! Our Turkeys range in weight from 16 -18 lbs (pre cooked). They are brined for 3 days, rubbed down with our blend of house mixed spices, then deep fried in frying oil until they’re crispy and golden brown. Deliveries will be Confirmed on Tuesday November 20. If you are picking up, please select Pick Up. No door to door deliveries. We will coordinate pick up points and times for Thanksgiving Day. You can choose any of these pick up points to retrieve your turkey. Please call 310-221-2879 for more information. If no one is available to take your call, please leave a message or send a text with any questions that you might have.